For most gardeners in our area not much is happening in the garden this time of year. January does bring a harvest of its own though in the form of garden catalogs. They really do seem to have a way of multiplying on their own, sort of like when zucchini gets out of control. A few years ago we had dozens of catalogs all from different companies sprouting from our mailbox. Like most gardeners Judy and I enjoy thumbing through the pages and imagining how much better this year’s garden is going to be. It’s not the same as actually being in the garden but it’ll do for now. I always say ” this will be the best year yet!” and it usually is at least in some small way. 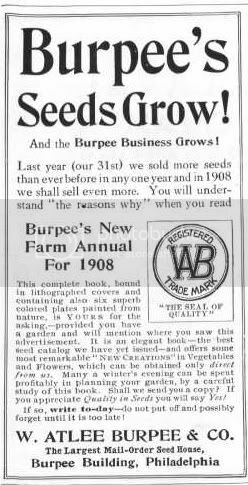 Seed catalogs have been around for a long time. Even though the internet has made seed and plant shopping virtually instantaneous I still like to peruse the catalogs first. Web sites have gotten better through the years but still have room for improvement. I guess I still prefer the tactile feel of the pages in my hands as opposed to the feel of the key board and mouse of the computer. Plus a lot of catalogs have specific, detailed growing information tailored to each plant. I have to admit however that when all is said and done, more often that not I end up placing my order on line anyway.